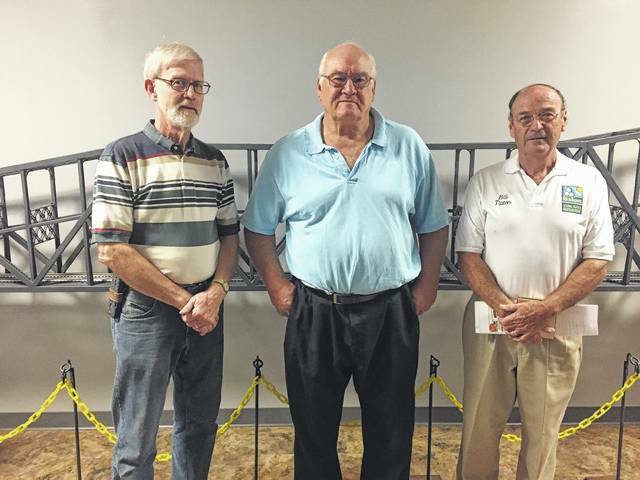 Model of the Chesapeake and Ohio Railroad Bridge built by Harold Virgil Woods Jr.
(Left to right) Mark Harris of Market Street Hardware, train enthusiast Dave Bauer, and Bill Tipton of Scenic Scioto Heritage Trail. The Chesapeake and Ohio Railroad Bridge, connecting the Siloam junction in Kentucky and Sciotoville in Ohio, is celebrating its 100th anniversary this year. The steel continuous truss bridge was designed by Gustav Lindenthal, and constructed in 1917 as part of a new route between Ashland, Kentucky and Columbus, Ohio. The bridge is continuous across two 755-foot spans and held the record for world’s longest continuous truss span in the world from 1917-1945. Today the bridge is operated by the CSX Railroad, which is one of seven major Class-1 railroads that operate in North America. 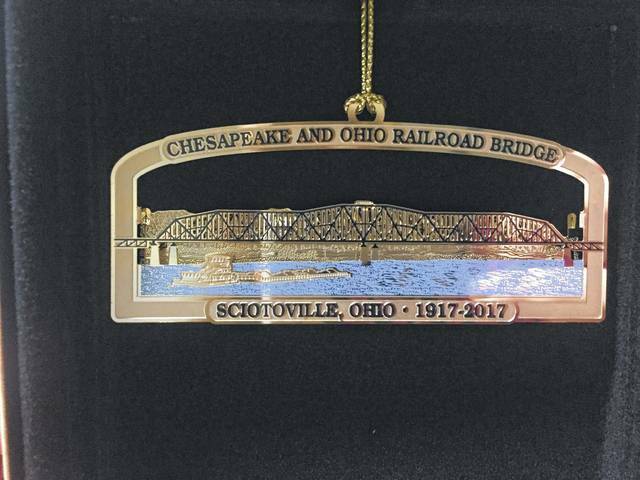 To commemorate the 100 years of rich history surrounding the Sciotoville Bridge, the Scenic Scioto Heritage Trail Inc., whose mission to advance tourism, promote the awareness and understanding of the area’s rich heritage and to identify and protect the scenic historical and cultural assets of the area, is selling ornaments displaying the bridge along with the dates of the anniversary. The ornaments are $15 dollars each and are available at the Scioto County Welcome Center, WNXT, Buckeye Dairy Bar, Market Street Hardware, and Robin’s Nest. Bill Tipton of Scenic Scioto Heritage Trail believes the bridge has played an essential role in the history of the county. “We want the local community to understand what an important structure they have here,” said Tipton. 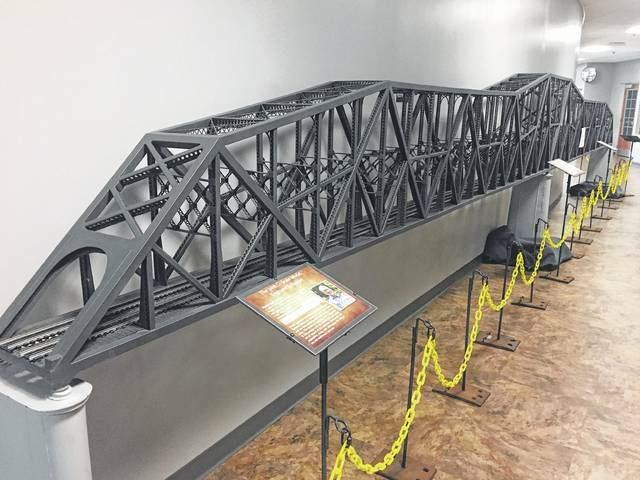 A O-scale model of the Chesapeake and Ohio Railroad Bridge, constructed by Harold Virgil Woods Jr., is currently located at the Scioto County Welcome Center. The model bridge will be relocated after it makes an appearance at the annual Train Show November 25-26. The Scenic Scioto Heritage Trail, Inc. is interested in compiling a booklet of personal stories and memories surrounding the railroad bridge. Please contact Bill Tipton at wtipton3@columbus.rr.com to share your story. https://www.portsmouth-dailytimes.com/wp-content/uploads/sites/28/2017/09/web1_Bridge-2.jpgModel of the Chesapeake and Ohio Railroad Bridge built by Harold Virgil Woods Jr.